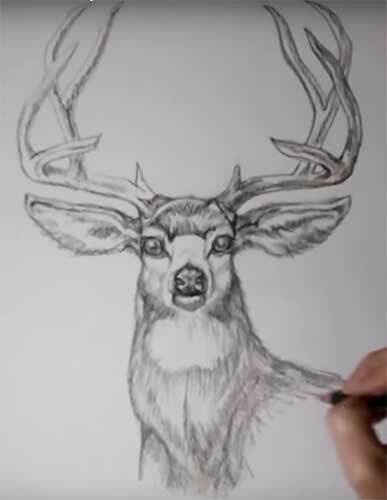 In this master class, we will look at how to draw a deer. 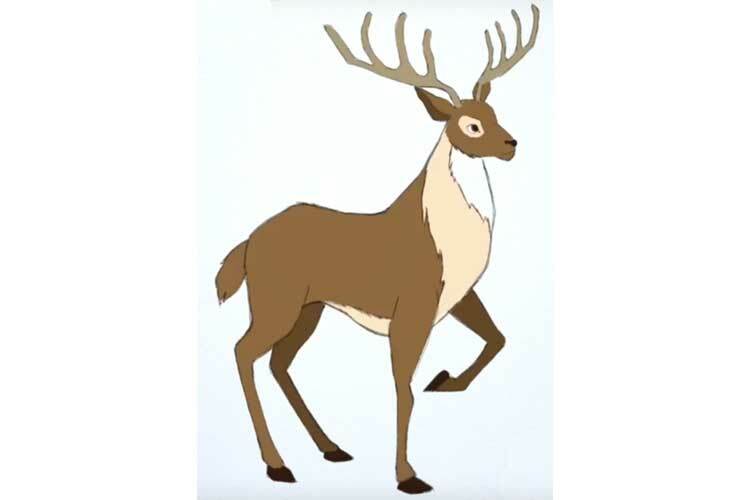 It is a graceful animal with branchy horns and elegant slender legs. In many cultures, deer are a symbol of loyalty, and their horns are a desirable element of decor. You will learn how to portray this proud animal, regardless of age and artistic skills. 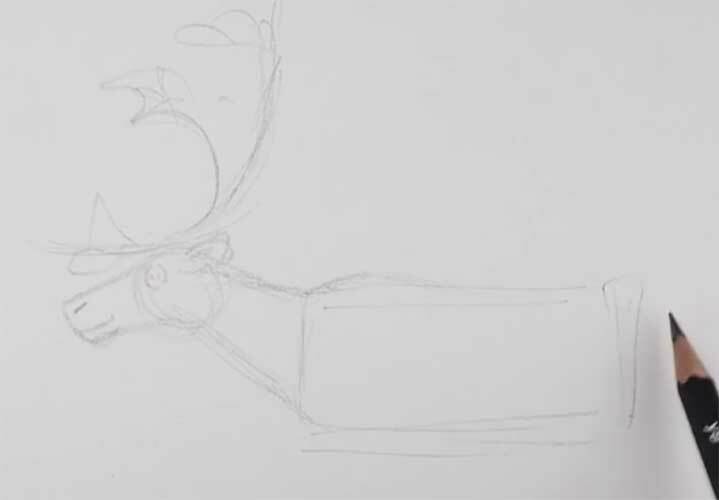 We begin the lesson with a detailed description of the sketch drawing. 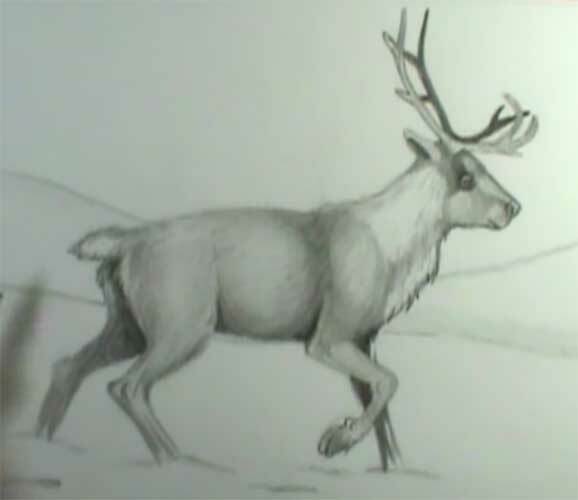 You will learn how to draw a deer in stages with the ability to compare each step with a reference picture. Break the drawing space into equal square sections. In the middle of the sheet, place two circles for the future body. 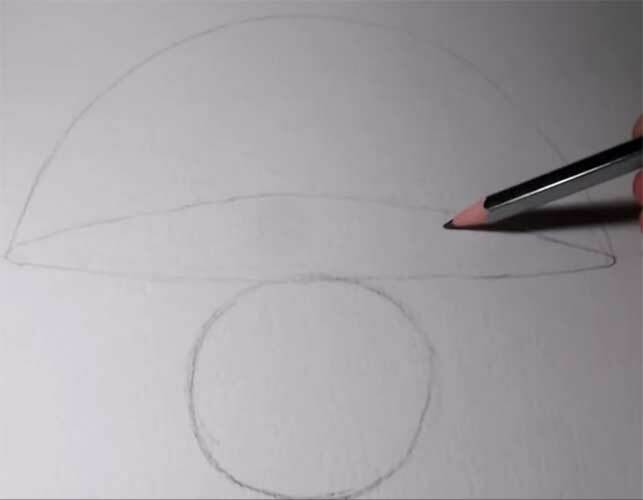 On the place of the proposed head, draw a small oval. The location of the legs of the animal is critical. Let the front be closed, and the rear – to be at a distance. Mark, the knee joints, considering that they should be placed somewhere in the middle of each limb. Note that the rear legs should be slightly turned and bent. Show all bends on the body and head, circling the outlined forms. Erase the auxiliary lines. Mark the elements of the face: eyes, nose and mouth, as well as symmetrical ears. For horns, first draw the main curved branches, and after that – their chapters. Try to keep the same size and slope. Mark the shape of the hoof. 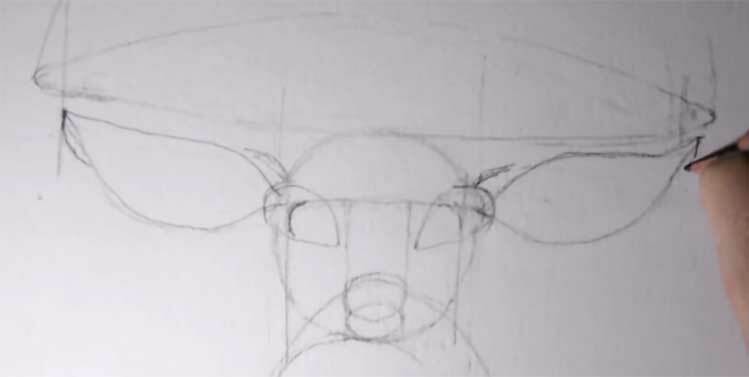 Draw in the details of the animal’s face, as shown in the figure. Please note that it is narrowed down. Add additional branches to the horns and show their volume. Try to smooth all angular lines. Give complete hooves. 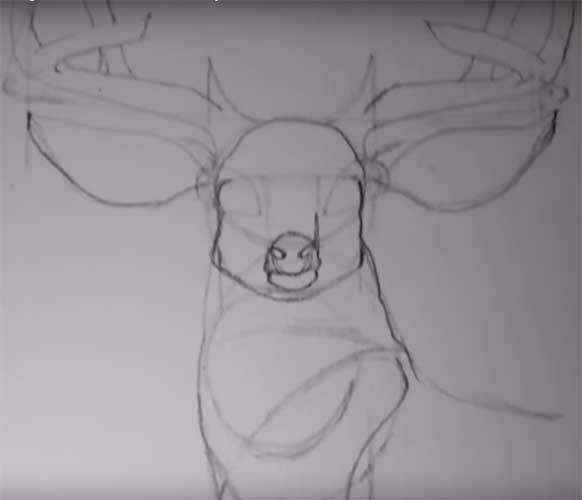 With the help of hatching, finalise the shape of the body and the head of a deer. You can also show the direction of growth of wool. If you wish, you can colour the resulting sketch. For greater realism, we recommend taking coloured pencils or soft pastels. An example of colouring you can see in the picture. When you start learning to draw, we advise you not to use anything extra, except for a pencil. It’s so great when any mistake can be fixed by using an ordinary eraser. 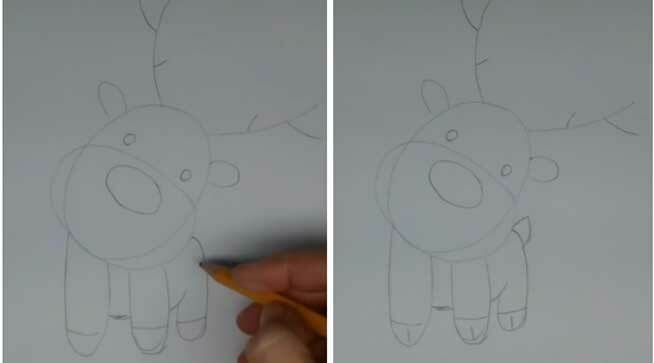 How to draw a deer with a pen, we will tell further. 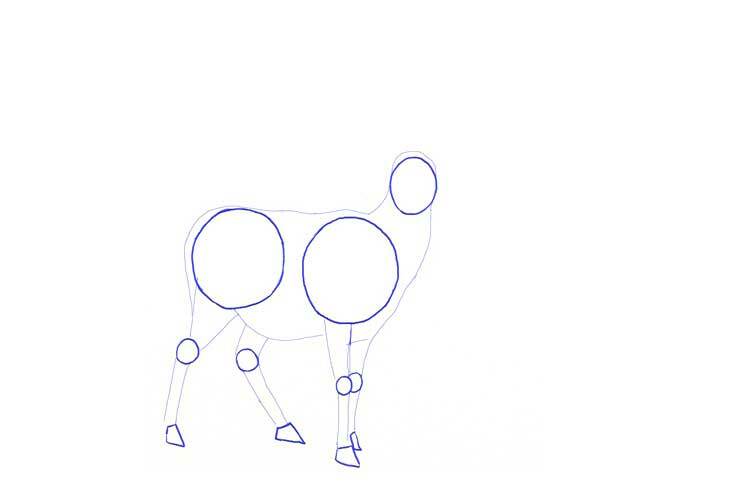 Draw two ovals for the head and shoulders of the animal. Connect by lines, showing the neck. Add circles for the body, determining the size of the picture. Mark the shape of the body, encircling the figure on the contour. 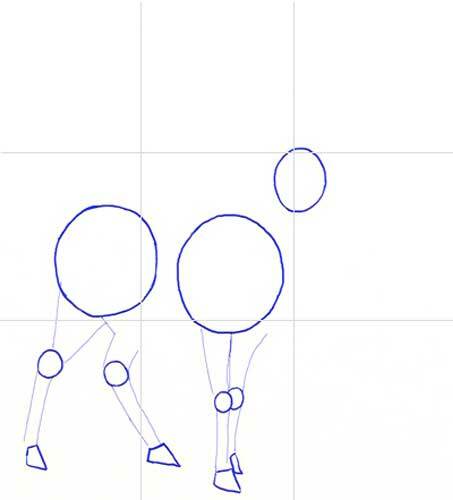 Sketch the position and shape of the legs. 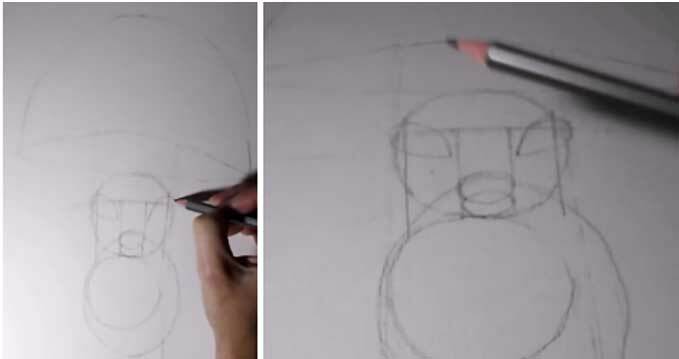 Mark, the size of the face, draw an eyelet. Give your legs volume, focusing on the contours. 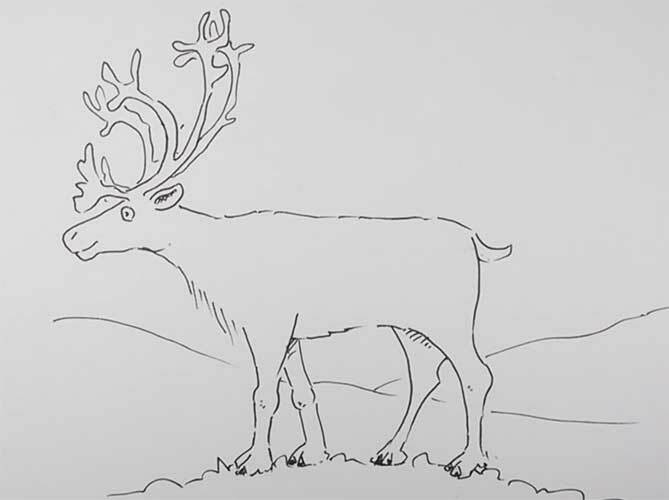 The idea of the drawing is such that three of them are in the snow, so only on one draw a hoof. Add a fluffy tail and a fur mane around your neck. Mark the basis for the horns, give them a volume. Draw the contours of the ear and eyes. The sketch should look like this. Carefully erase the auxiliary lines. Brightly highlight the contours, add expressiveness to the muzzle, draw a fur coat. Next, use the hatch to colour the deer. Different intensity of pressing will help show colour transitions. We will not forget in our lesson about the smallest artists. 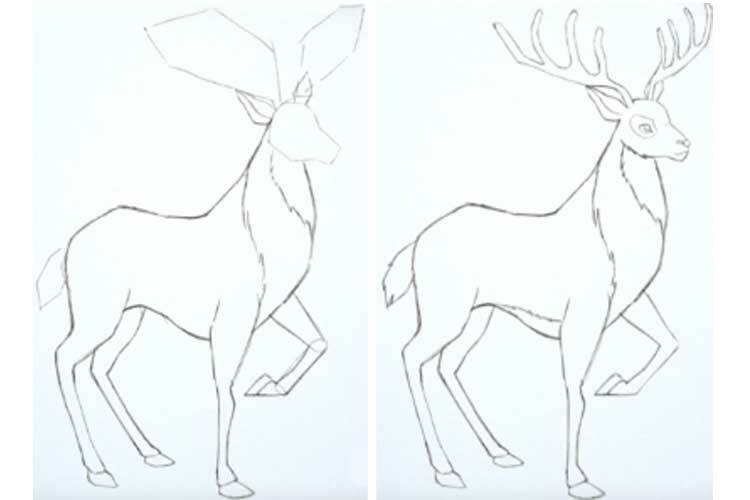 A simple and beautiful drawing of a deer will allow the child to develop excellent motor skills for accurate writing, as well as perseverance and abstract thinking. 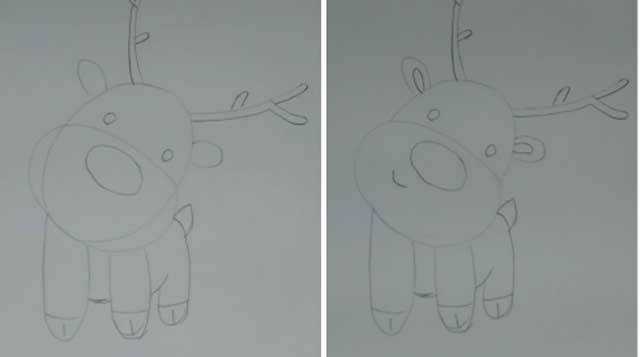 So, learn how to draw a deer for children. Draw two crossed ovals: a head and a muzzle. Mark ears and horns. Draw small branches with small oblique lines. On the face in the upper part, draw a big nose. Mark with small circles. Below the chin, draw the two front legs of the fawn. Crosslines indicate hoofs. Do not forget about the back leg, which is visible at this location of the body. Divide each foot into two halves. Draw a little tail. Give volume to the horns and ears. Add a smiling mouth. Use a black marker to circle the desired contours. Excess erases eraser. If you wish, you can colour the fawn. 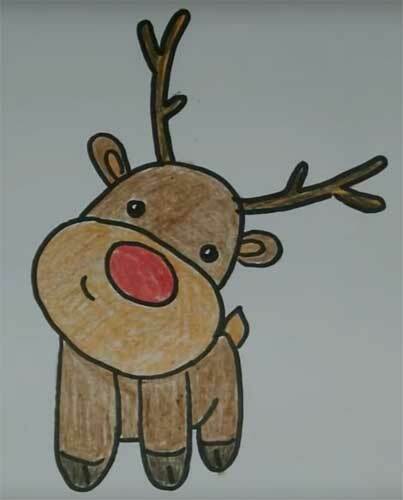 Use three colours: brown for the body, black for the hooves and, of course, bright red for the nose. 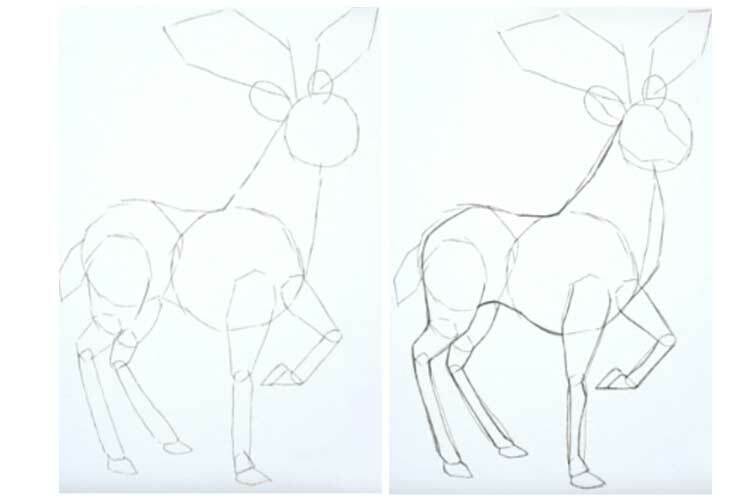 For those who begin to comprehend the basics of art, the highest interest is how to accurately convey all the features of this deer, given the animal’s anatomy and proportions. 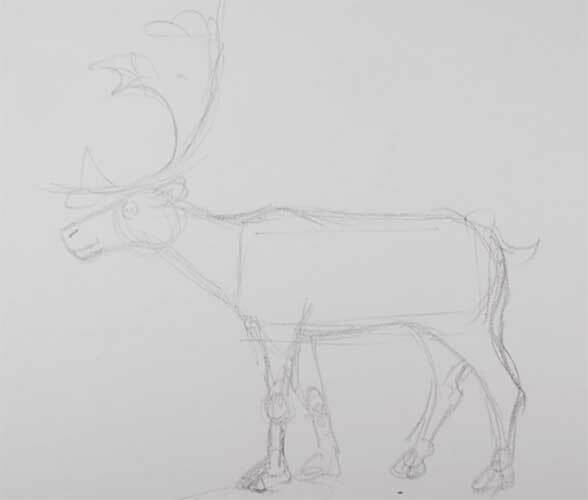 Our master class will help you learn how to draw a deer for beginners, citing detailed sketches. 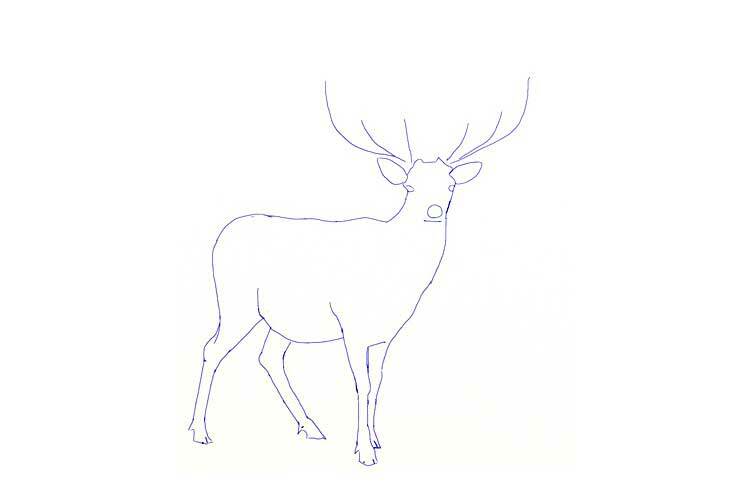 Draw the head and shoulders of the animal with ovals, connect the lines denoting the neck. Extend the torso with another circle. Draw tail and legs. Lastly try to break into separate elements. Add a schematic view of the ears. Outline the place where the horns should be placed. Further on the received contour start to connect lines. Try to emphasise the smooth bends of the body and legs of the animal. Shape your face. Erase too much. Show the presence of fur on the chest, abdomen and neck. 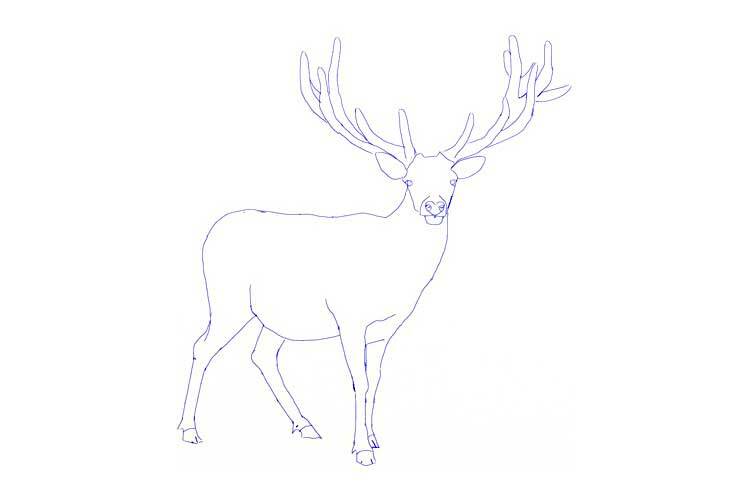 Draw a pair of horns, as shown in the picture. Finish making your face: draw an eye, draw a spot around it, add a nose and mouth. Living conditions in the north force deer to adapt to frost and snow. They are not tall and have long legs. Broad hooves make it possible not to fall into the snow, thick and warm fur covers the whole body and hangs around the neck like a mane, sprawling horns crown on the head. 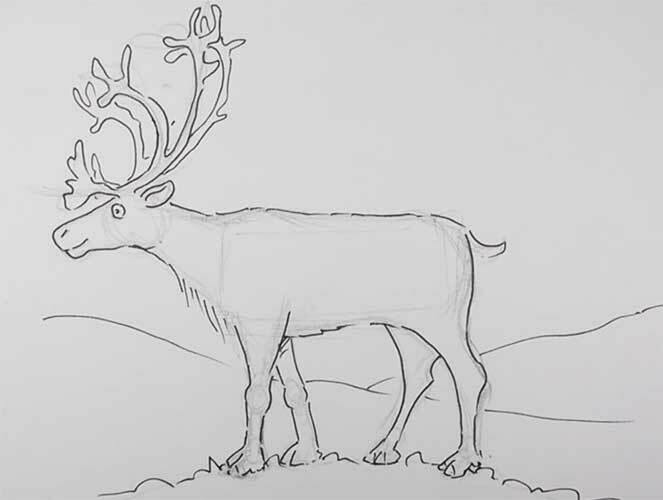 Knowing all these features of a magnificent animal, we will readily understand how to draw a reindeer as part of our lesson. So, sketch the following outlines on your leaflet: the body in the form of a rectangle, slanting necklines, a circle for the head and an elongated rectangular muzzle. 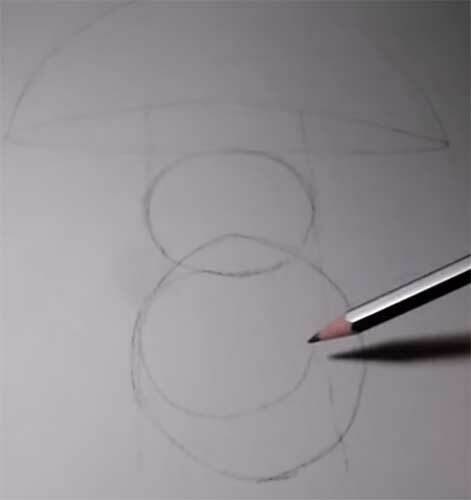 Draw the nose, mouth, eyes and ear as shown in the image. Mark with careless curved horn lines. In height, they should exceed the body. Smooth the lines, make them smoother. 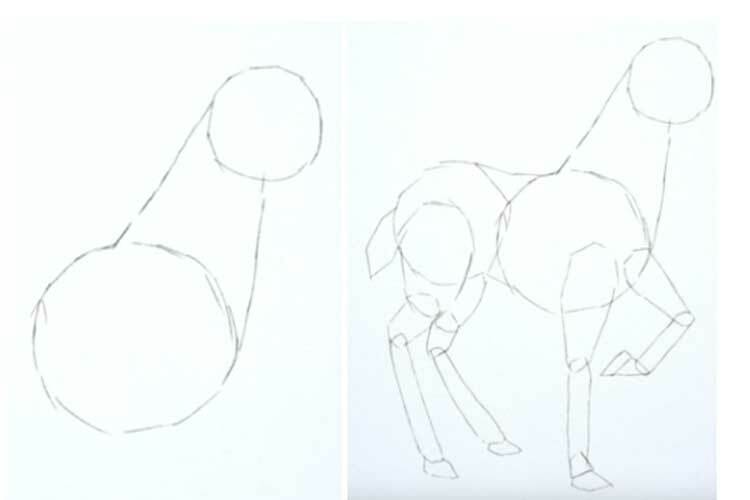 Draw the legs and tail. Mark the shape of massive hooves. Circle the desired contours with a thin gel pen. Draw the environment in the form of grass and open slopes in the background. Erase unnecessary lines with an eraser. Underline the shading shadows. At the end of our master class, we will pay attention to the anatomical features of the head and muzzle of a deer. 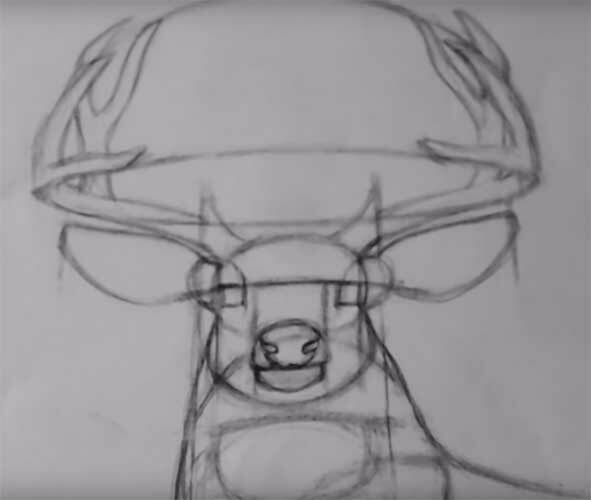 So, how to draw a deer’s head, observing all proportions and not departing from realism. Draw the following geometric shapes: a circle and a hemisphere above. At the bottom of the circle draw an oval, inside it, a little to the side, another ring. Draw elements on the head. Mentally divide it into two parts: at the bottom, there are two circles – a muzzle, at the top – two symmetrical eyes. Draw the ears, which in length should not go beyond the boundaries of the hemisphere. Add detail to the eyes. Turn the horns portray, focusing on the edges of the hemisphere. 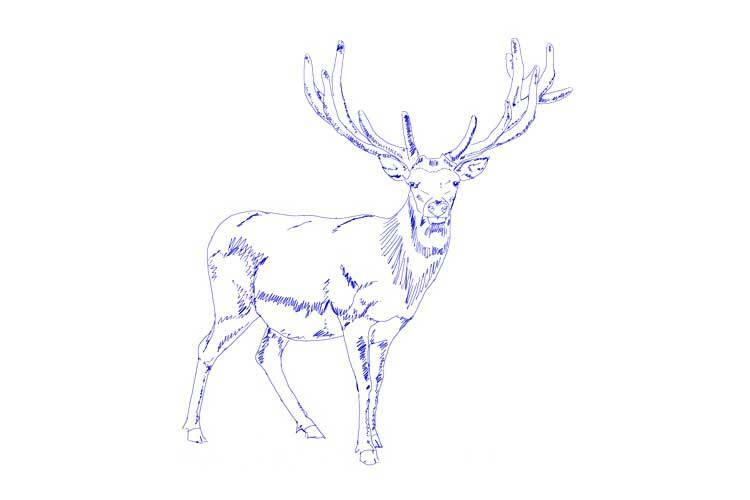 Specify the location of the nostrils and mouth on the face of a deer. Smooth lines combine head and neck. Erase new parts and lines. 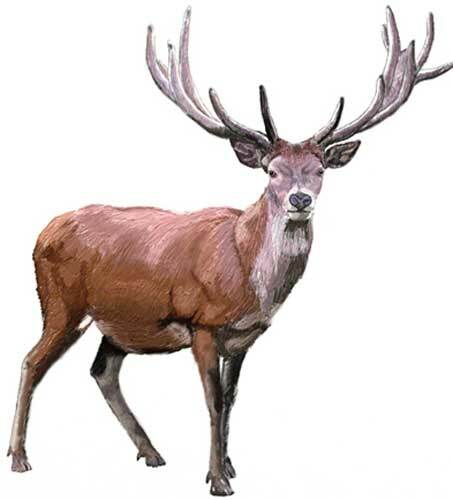 Using various hatches, show the volume and location of the fur on the body of the deer. 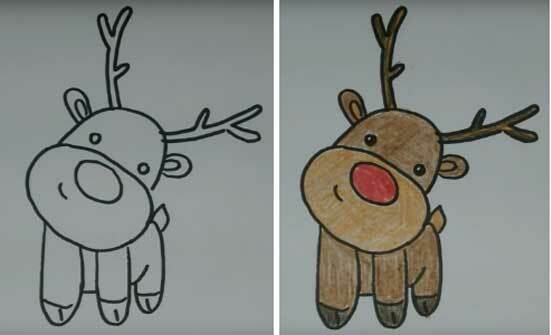 We learned how to draw a deer’s face to depict an animal not only from afar but also close-up. If you do not have the task to create a realistic image, add cartoons, use unusual facial expressions and the expression of the face. Express your imagination, and we hope that our lesson will help you with this.